Hey MCB mag fed players. You may have noticed my obsession with trying to find the most optimal load out for mag fed play. Well these inserts help a lot! They allow for easy, fast reloads with no bungee or flaps to get in the way. Quick response insertion for empty mags, no more dump pouches! And can be made for pretty much any mag and mag pouch. I'm thinking of making them to sell. Would anyone be interested? I will make these for $10 CAD per insert plus shipping. That is almost completely material cost. I work slow. If you want them PM me! I don't check this thread much. Last edited by Stilgar; 04-22-2018 at 06:35 PM. Very cool! I've been meaning to experiment with kydex to do something similar for 10 round tubes. 3 could fit in an AR-15 mag shingle if there were something to keep them separated. Didn't know Canadians used that vernacular. You must be from Southern Canada. Very cool! Not quite the same use I was imagining. I use 10 round tubes to cram and jam onto my markers so I need access to individual tubes. Three of them fit fine in a single shingle - as one of the images in the post you linked shows - but in my experience they aren't as secure as I would like, and if you use one or two the remaining tubes can lean or slide around in the pouch. 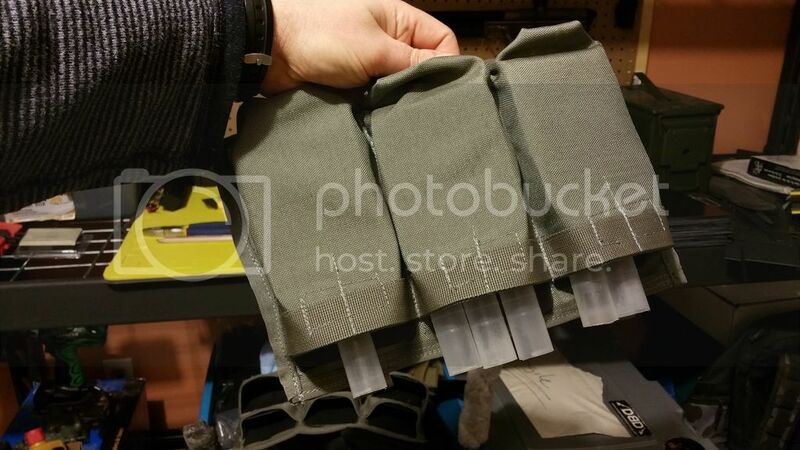 A kydex insert in the shingle pouch would retain and space out the tubes for easier individual access. Could you check if the kydex inserts work on 3, 2, and 1 tube in a shingle? If so I might be interested in buying a few. yeah I would be interested what cost/price you thinking? So these are not standard m4 pouches. They are designed for larger pb mags. And still they held the tubes with no issue. If I was to make them for tubes I would probably shape them a bit different for them. As for pricing, based on material cost and time I am looking at $10 CDN per insert plus shipping. I can give a discount for larger orders.